The world is brown now, and not a good brown, not a rich brown, not an earthen tone that looks warm against the skin and tastes good upon the eyes. No, this is the brown of death, of drought, of crippling heat, of climatic records driven to the brink of extinction, then cast over the precipice of what was. It started with drought, that’s all, the last appreciable rain falling in early September when the remnants of Hurricane Hermine came through, what with her tornadoes and floods and hail and wind. But after that? Nothing worth talking about. In fact, what little rain came after just made it worse. The few snow and ice storms we had helped get winter grasses started, but then the drought killed them and left dry kindling in their place, more dry kindling than we already had, more fuel for fires that swept the state, killing some, maiming others, knocking down home and hearth from border to border. And the spring storm season gave us a few tornadoes, more lightning than the parched state needed, and a little rain here and there, just enough to start the spring growing season before the drought killed that smidgen of greenery, so more fuel for the fires, more death, more brown. 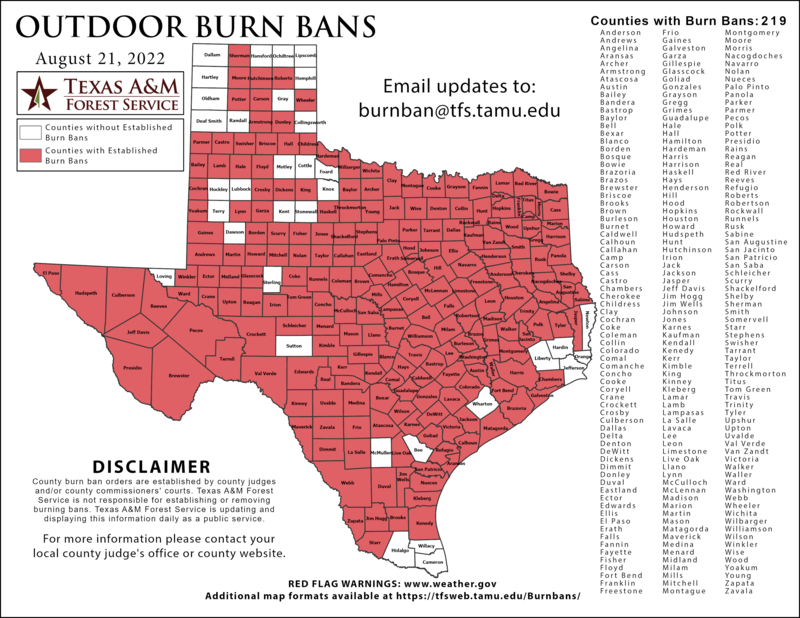 Burn bans spread almost as quickly as the fires did, crimson warnings seeping from major wounds in the map of Texas and spreading, oozing, spilling in every direction, all the while chasing the flames that gushed across the landscape. And still no rain. Then summer blasted in on the heels of a spring that grew hot, too hot, and summer’s been hotter, really hot, splitting the skin of weather records and pouring salt in the open wounds of worry. Insects are scarce, something people have noticed since we’ve had no mosquito problems for quite some time, a surprising fact since we always have mosquito problems, even in winter if the day is warm enough. And people noticed there are no moths around outside lights at night, and that surprises folks because, like mosquitoes, we always have moths and butterflies, as long as the day is warm enough. I found the majority of wasp and bee nests have failed, many abandoned before they were completed, even in the nesting box I built early this year on a sleepless night, the majority of the abandoned attempts losing their queens over a single two-day period when temperatures soared and refused to fall, and climbing steadily higher since. I’ve seen more dead insects than live ones and so few spiders that it feels like a famine of the sort. Dragonflies and damselflies, at least the few that can be found, spend too much time on dead plants and parched earth, some landing never to move again, most in fact, and detritivores like millipedes and isopods have been no-shows this year, much like the fungi season last autumn and again this spring, complete no-shows, not even vain attempts to keep up appearances. Ants venture out in the coolness of morning, but around dawn is the only time to see them since it’s too hot most of the day and night, and I’ve seen only a few katydids and grasshoppers, something that really put the halt on the digger wasps who built nests only to abandon them due to lack of food for their young. Though some might find it kin to karma, house sparrow numbers have declined, the flock that’s lived around my home for decades having diminished until it’s just a whisper, no more than a quarter its normal size for as long as I’ve lived here, and like them most birds are suffering, both young and old, both native and not so native, because when the bottom of the food chain suffers like this, the effects ripple along the links making sure everyone suffers. Armadillos have been brazen and apparent, seen almost every morning before the sun grows too high and the day too hot, and their signs outside my patio have become almost desperate, each morning revealing more digging and destruction as they hunt for anything edible, sometimes digging deep and sometimes digging gaping holes and sometimes digging trails to follow the ants who won’t venture topside except when absolutely necessary. Three great purple martin roosts form a triangle around the metroplex, their enormous sizes making them oft watched radar regulars at the National Weather Service, but this year the numbers are down, way down, with most nests failing because young were too hot, too hungry, too thirsty, too weak, many abandoning the nest houses to escape the heat, only to be exposed to direct sun and predators without parents to help them. I can’t count the number of unready young who fledged before becoming fledglings. House finches, mockingbirds and mourning doves nested in the tree outside my patio, and all three species failed to fledge young, the mourning doves having tried twice before giving up, and I felt surprise seeing the mockingbirds bringing mostly fruit to the one hatchling they had who only lived a few days and spent most of that time crying loudly as though the same old berries weren’t cutting it and the few insects offered were just a painful tease. Bats and common nighthawks vanished almost as quickly as they appeared this year, what with the nights empty and lights left lonely for the insect dancers who once upon a time filled their luminance with endless performances, but not this year, and so dawns and dusks are empty of the night flyers who have never been absent as long as I can remember, and the lights long for the moths and beetles and other bright lives who once filled the void with shining lines traced on dark backgrounds. So now the whole state is in pain, climatologists saying the need here is more than 15 inches of rain just to get to a comfortable place, and saying it’s not going to get better any time soon, and the Forest Service saying all of Texas is a tinderbox ready to burst into flame, and farmers in the same area having long ago given up hope for crops of cotton and wheat and such, and ranchers culling herds because there’s not enough water and not enough grass and hay costs too much since it has to be shipped into the state since none of the Texas hay crops grew into anything more than fodder for wildfires. Secretly like everyone else in the state, residents wish for an energetic hurricane season with multiple strikes on the Lone Star State, drenching rains being the primary need with other considerations becoming less than secondary, but like the storm seasons of last autumn and this spring, hurricane season is looking less promising for Texas, and the drought goes on and surpasses the Dust Bowl in severity and blows away other drought records like they were so much childish scribbling, and the heat goes on and begins a serious effort to challenge the heat wave of 1980, the heat wave to end all heat waves for the 40+ years I’ve lived here, and all the while we miss the rain, and relief from the heat, and the normalcy of nature, all of which now seem so far removed and so imaginary as to be from another world. As we head into the season for migrations, both butterflies and birds alike, I worry what these creatures will find when they reach this place, for even now the hour is late, and there is no chance for recovery before they begin passing through, and what they’ll find here is a growing desolation, dry and parched land with no plants and no insects and no relief from unrelenting heat. This place has become the kind of miserable that’s felt from the lowest to the highest, from the least to the most, and we’re all suffering, and waiting for change, and watching the sky, the forecasts, the prognostications, and wondering how bad it can really get since no one’s willing to say it can’t get any worse, because we know it can, and it has, and there’s no reason to think it won’t if that’s to be the way of things. But not always replete with an arachnid hiding behind the nest, an unwise move for any spider trying to remain hidden from a predator that hunts such creatures. Still, these multicellular constructs rarely elicit more than knowing glances from most humans. They result from the efforts of a female mud wasp; in this case, the black and yellow mud dauber (a.k.a. mud wasp; Sceliphron caementarium). Ubiquitous in this area and certainly no stranger at the family farm (a massive shared colony exists beneath the side porch), these solitary yet extroverted insects are as docile as they are beautiful. Thread-waisted wasps such as this species beguile me with their graceful shapes and diligent attention to architecture. The carefully crafted and carried bundles of mud, such as the one clear in this photo, must meet strict guidelines for use before they are manipulated into building materials fit for such a queen. But daubers do not always dabble in mud. Sometimes their quest to ensure future generations involves the hunt for dry dirt. Such missions result in a very different kind of birthplace. When first I posted photos of this kind of nest, even xocobra admitted at a later time that he had never seen such a thing. I felt no surprise in that revelation as the wasp responsible for this chamber prefers solitude and stealth over the more conspicuous assemblies of the mud dauber. Unlike the nest attached to a window screen on the patio, this common potter wasp (a.k.a. dirt dauber; Eumenes fraternus) found a delicate spot hidden in the foliage of the photinia bushes around my patio wherein she might manufacture the artificial womb that her single offspring would inhabit. I watched her for some time as she came and went, fetching more dirt from a place of open earth near the patio fence, then diligently returning to this location time and again until the pot was complete, ready to be fitted with caterpillars meant to feed her child until its maturity. Yet once complete, she left the shrubs and found a second nesting site at the border of one of my patio windows. Her activities charmed me endlessly as the container grew from thin base to complete jar. When finished, she began stocking it with small green caterpillars, each one carefully placed inside before she dashed off to find another. And when the whole of the supply order was filled, she tucked her ovipositor inside, laid an egg, then sealed up the container with yet more dirt. All of these nests save one already has erupted with new life. That’s sixteen cells for the mud dauber and four pots for the dirt dauber, and only one of the potter wasp nests remains sealed, something I expect to change in the next few days. Watching these magnificent beasts in their painstaking quest to reproduce has given me a profound sense of scale and wonder. My morning was spent running errands. After going to the vet, the pet supply shop, the coffee shop, and a few other places, I stopped at Rick’s place to take Wylie out for a walk (I’m dog- and house-sitting again while Rick is out of town). Once I had finished my pre-lunch canine session, I continued on to the store to pick up some groceries, after which I finally headed home. It took several minutes to get everything out of the car and into the house, followed by several more minutes to put things away. I followed all of that by starting the laundry. Finally able to sit down, I decided to catch up on the news and my favorite blogs. I took my normal spot in the desk chair, signed on to the laptop, and immediately stopped when I thought I heard something buzzing in one of the windows by my desk. I sat quietly for a moment and heard nothing else. Must have been my imagination, right? My attention returned to whatever I was reading at the time. Only a few seconds passed before I once again thought I heard buzzing coming from behind the blinds. That time, I decided to investigate. I stood and walked to the window, then I gently and slowly opened the blinds. Sure enough, there was a wasp hidden at the top of the window. It sat grooming as though it had neither a care in the world nor a bit of concern for its environment. Its position actually gave me the advantage. It was almost perfectly vertical with its head tucked behind the top frame of the blinds. That meant its back was to me and it probably couldn’t see anything except what was at the bottom of the window. I quickly pulled out my trusty self-closing tweezers, reached between the blinds, slid them around its wings, and gently closed them. That’s when it noticed me. But it was too late. Gripped in the tweezers’ solid yet soft embrace spanning both sets of wings, the intruder would not be escaping. Keep in mind The Kids will dispatch such interlopers if they are discovered. Also keep in mind I had no intention of leaving a wasp running around free in in the house. Sorry, but that’s asking for the kind of trouble I don’t need. Carefully so as not to hurt it, I withdrew my captured target with medical precision. It passed unencumbered between the blinds. I then carried it out to the patio—along with my camera. As you can see, it was nothing more extraordinary than a simple black and yellow mud dauber (a.k.a. mud wasp, Sceliphron caementarium). A few of these thread-waisted wasps have nested in my garage for a few years. I try to dissuade them by knocking down the early incarnations of their nests. Why? Because the garage is an enclosed space, as is my car, and were one of these little critters to find itself cornered with me in such an enclosed space—especially the car—I’d be in a serious world of hurt. It therefore behooves me to disincline them from nesting in there. But on the patio? That’s another story. I’ve had potter wasps and mud daubers nesting on and around the patio for some time. While I don’t allow paper wasps or yellow jackets to nest out there, I don’t mind these less aggressive and more predictable species. As you can see, she was safely held where no damage would come to her (and I’m assuming it was a her and not a him). The tweezers do not exert significant force and are made for handling insects. The smaller the prey, the less force they apply, to wit, they apply more force to larger objects than smaller objects (that’s simple physics for such contraptions). She did try to sting the tweezers a few times but was in no position to get a solid shot at it. Besides, the tweezers have been assaulted by far worse creatures and have survived. That’s a similar shot to the first one, only with better lighting methinks. She apparently had picked up a piece or two of dust from the window. Gee, someone should clean more often. After snapping these three photos, I felt I’d tormented her enough and decided to release her on the fence. I set her down until she had a firm grip, then I squeezed the tweezers enough for her to crawl away. And she did with much rapidity. But then she stopped. She never even turned around. She simply began grooming and checking her wings. For my part, I stayed behind her where I felt safer… as in, out of sight. I watched her clean herself from head to toe, carefully fluttering her wings from time to time after giving them a thorough looking over. When finally she felt bathed and ready to face the world again, she flew into the air and disappeared around the corner. As for how she got into the house in the first place, the garage is my preliminary guess. Perhaps she followed me inside as I was unloading groceries and supplies today. Then again, she may well have followed me in the patio door during one of my many jaunts outside. Who knows. She’s not the first wasp to make such a bold incursion, although she fared better than the last one who made that mistake. Similarly, a housefly or cousin recently invaded and buzzed around the window for a while. The Kids caused such utter chaos and devastation trying to catch it that I eventually was forced to dispatch it myself with a swift pop of a kitchen towel. Five felines don’t take kindly to uninvited guests; likewise, uninvited guests seldom survive their visits. And in the meantime, karate cats flying about with abandon tend to destroy or displace just about everything that’s not bolted to the floor. I was therefore thrilled to have found and saved this one before it came to an untimely end, one that I’m sure would have been unpleasant at best.